This will be Maggie Moran's first foray into campaign management at any level, although she does have fairly extensive experience within the politicking world. She was a senior advisor during Corzine's first successful run at governor as a well as the NJ State Director for US Senator Franken Lautenberg (D) for several years. She clearly has political know how, but is it enough to erase the current deficit? Probably not. 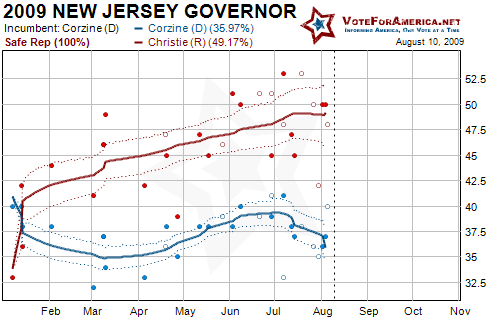 Bill Stepien has managed several successful state level campaigns for Republican candidates in New Jersey. He also managed Bob Frank's (R) failed bid for the US Senate in 2000 against Corzine. He was also the National Field Director for John McCain's and Rudy Giuliani's 2008 Presidential bids. Stepien clearly has the experience and the lead this time around. I would expect the Christie campaign to soften the dialogue in an attempt to prevent something stupid. Although the McCain and Giuliani campaigns melted down, Stepien wasn't responsible for the campaign's message, this time around he is. Can he avoid doing something catastrophically stupid? Probably. Joe Abbey is another Democratic rookie, but he has considerably more experience than Moran. Abbey was the Deputy Campaign Manager for Mark Warner's (D) successful 2008 US Senate Election, a candidate who realistically didn't need a campaign manager. He has also ran a number of state level elections with varying degrees of success. If Abbey can run a successful issues based campaign and really promote voter turnout, Deeds should win. Whether this can actually be done remains the question. There is relatively little information about Phil Cox, but a google search reveals possible connections with disgraced and now imprisoned lobbyist Jack Abramoff. 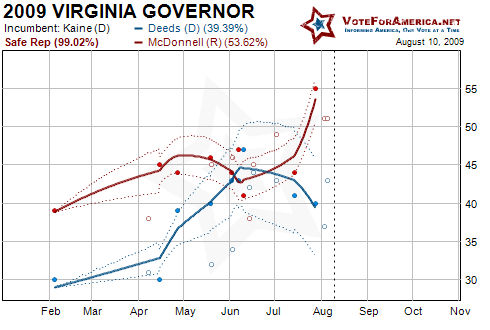 These ties came up in the 2005 Virginia General Assembly Election in which Deeds lost to McDonnell by 350 votes; Cox was McDonnell's campaign manager in that race as well. Unless some new information emerges, this pseudo-scandal is unlikely to affect the Governor's race. More in a week. I'm tentatively planning to look at the money race.